Humanity has been brought to the brink of extinction. Each night, the world is overrun by demons. Bloodthirsty creatures of nightmare that have been hunting the surface for over 300 years. A scant few hamlets and half-starved city-states are all that remain of a once proud civilization, and it is only by hiding behind wards, ancient symbols with the power to repel the demons, that they survive. A handful of Messengers brave the night to keep the lines of communication open between the increasingly isolated populace. Briar Damaj is a boy of six in the small village of Bogton. Half-Krasian, the village children call him Mudboy for his dark skin. When tragedy strikes, Briar decides the town is better off without him, fleeing into the bog with nothing but his wits and a bit of herb lore to protect him. After twenty years, Ragen Messenger has agreed to retire and pass on his route to his protégé, Arlen Bales. But for all that he’s earned the rest, he has no idea what to do with the rest of his life. When he learns Briar, the son of an old friend, is missing, Ragen is willing to risk any danger to bring him safely home. Any new fiction from Peter V. Brett is something to celebrate. He is probably my favourite fantasy author, and his series has been riveting and addictive from the beginning. Messenger’s Legacy, the third novella in the best-selling, superb Demon Cycle world, is another good addition to the series. It focuses on a new character, Briar, and also the messenger who took in Arlen, Regan. What begins with a rather idyllic, but not easy look at the life of Briar and his family turns into tragedy pretty quickly. Briar is half-Krasian, so he and his siblings, not to mention his father, are frequent targets of local resentment and racism. I liked the way Brett wove this into the story — it doesn’t dominate, but it also offers some great commentary on contemporary Western society. It’s a good-length novella, and I was entertained from beginning to end. The scenes at night, as Briar or Regan (or both) dealt with the corelings are superb — the author is always advancing the readers’ understanding of how these demons function in the world, and I liked the new ways Briar develops to protect himself living in the swamps. A great short story, and also a great lead-in to the fourth novel in the series, The Skull Throne — Briar will apparently feature quite centrally in that book. It’s published in March/April 2015, and I really can’t wait. I think I may have enjoyed the previous two novellas, Brayan’s Gold and The Grand Bazaar, a bit more than this one, but this was still very good. If you haven’t tried the series yet, then I strongly urge you pick up The Painted Man (UK)/The Warded Man (US) immediately. While you’re at it, get The Desert Spear and The Daylight War at the same time, because I doubt you’ll be able to read just one. This series has my highest recommendation. A must-read. 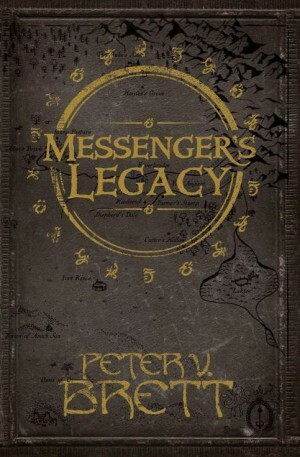 Messenger’s Legacy is published in the UK by Voyager, and in the US by Subterranean Press.